and are trick plays sometimes seen in handicap games. This is the canonical tricked sequence. 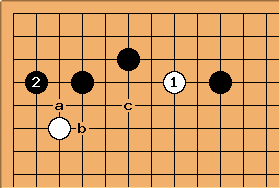 As a and b are miai, so for all practical purposes Black will need to give up two stones, either the chain with or the chain with . 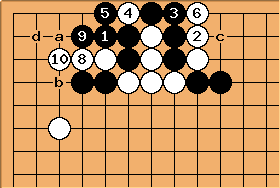 Question: could somebody give the followup for white after black plays either a or b? 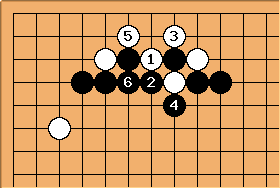 I don't see why black has to give up either of the two groups of 2 stones. hhw: Black can "save" two stones, but at great cost. After , Black a, White b, Black c, White d. And the result does not look good at all for Black even though at the beginning, he had three stones in the corner against one from White. There are several ways to counter the trick play. The first is to ignore altogether and settle the group by taking the corner with . 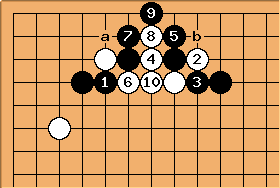 Alternatively, can consider playing at a, White b, Black c instead. Either way, the corner territory is not smaller than the side territory, and is left floating and subject to attack. Another way is to play in response to . This will result in a fight. Sure this is good for black? Fan Hui calls this the ripped keima, Shape A to avoid (see: L’âmeDuGo). unkx80: Sure but its debatable. At the same time, starts a splitting attack, which is likely to injure . 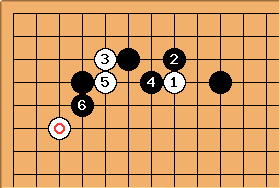 For simplicity I would recommend as in the previous diagram, but this variation looks playable too. 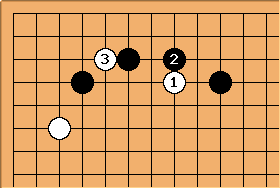 Uberdude: Maybe it's harder to spot, but white also has one of the classic bad shapes from Fan Hui's L’âmeDuGo: the marked white stone and 5 form a broken elephant jump, with black 6 splitting them at the vital "elephant eye" point. When both sides have bad shape in fighting like this a superficial "spot the ripped keima" detector is not sufficient to judge the position. Even as late as here, Black still has a chance of turning things around with the double atari at . In this case Black can make a strong wall outside.